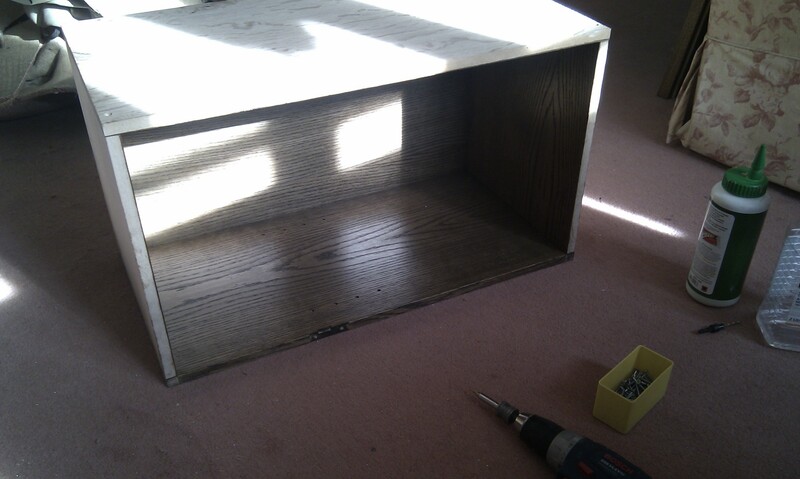 The media cabinet is glued and assembled. 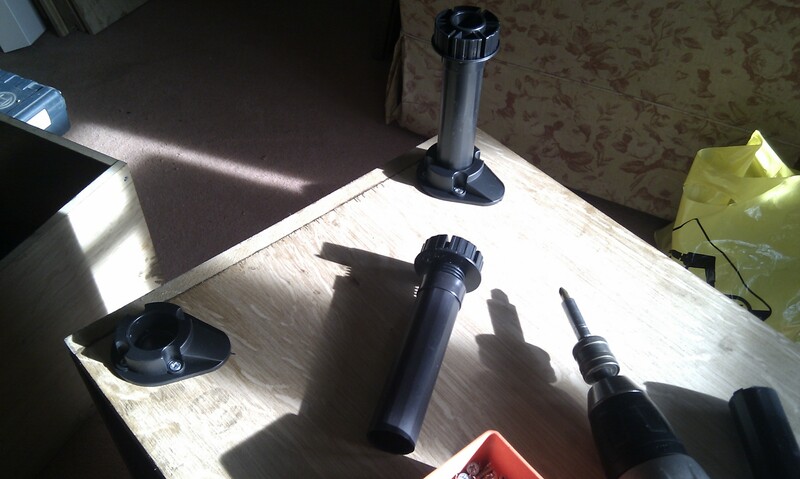 Adjustable cabinet feet are then fitted. 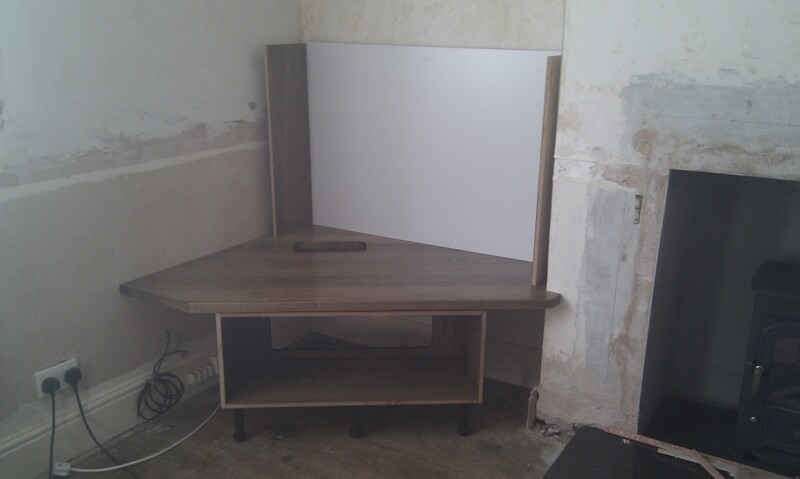 Once the Oak media top is scribed and cut to fit. A groove is routed (shown later) along the back edge to receive the lower back panel. 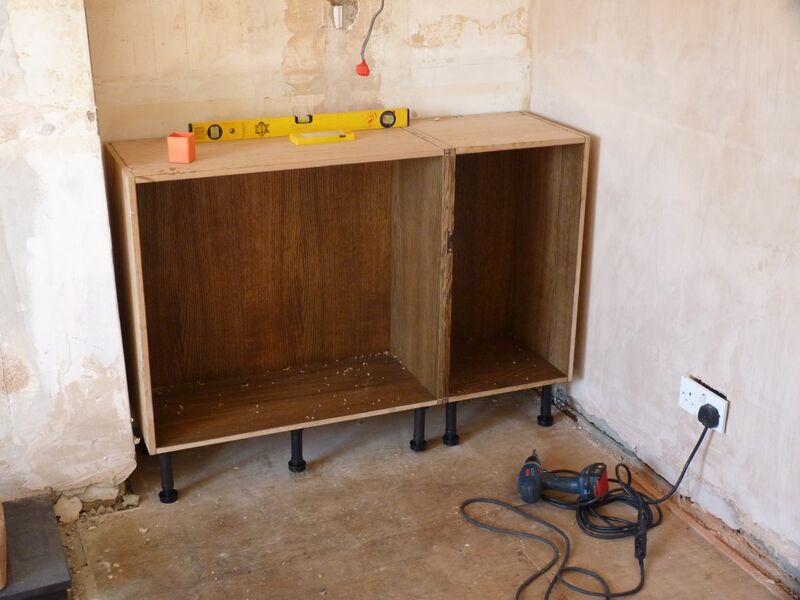 The media top is then fixed to the wall supports with stretcher plates (angle brackets that allow for expansion) and the lower cabinet is positioned and fixed up in place. The upper cabinets are are assembled, levelled and adjusted for plumb before fixing in place and anchoring at the top to the back wall. 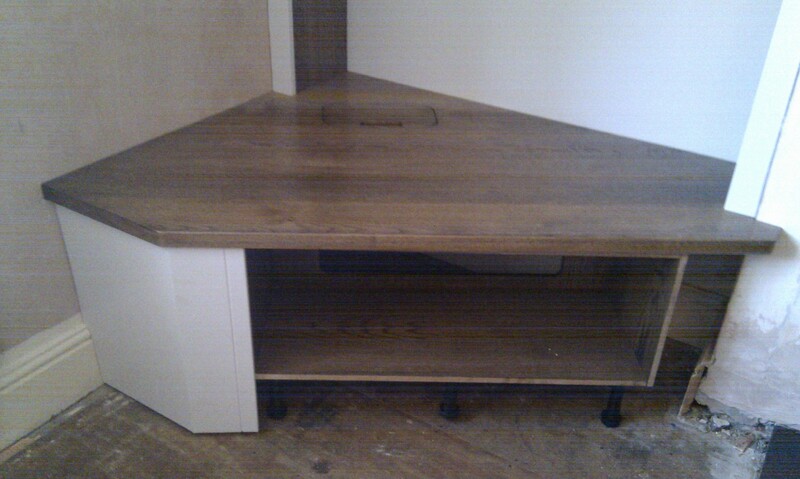 A drop cloth is used to protect the Oak top. Here can be seen the wall scribes in place, these are cut to create a neat joint to the wall and the complete the fitted look. I got a bit carried away here and forgot to take photos, it might of been the caffeine rush from a constant flow of tea! There are some pictures of the wall scribing process captured on day 2 latter on, taken on a better camera! 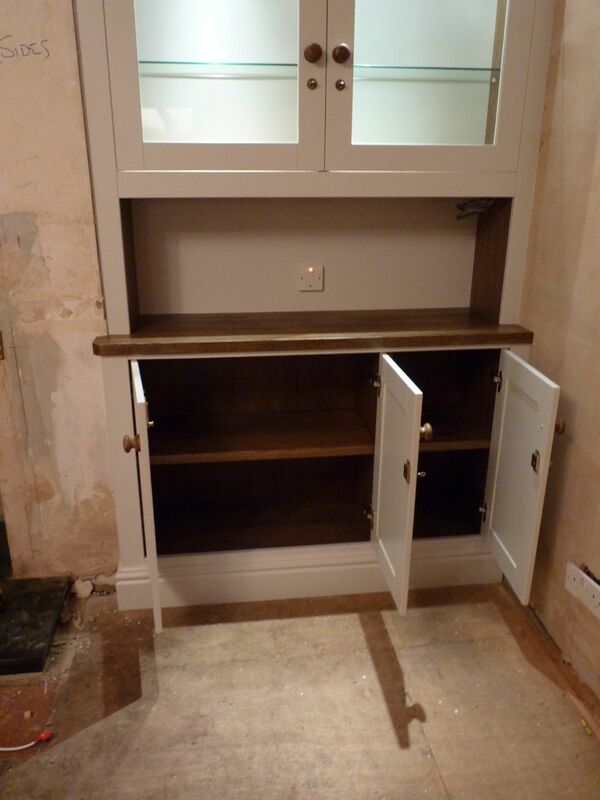 Lower cabinet scribes are cut round existing skirting and fixed in place. The floor joint will be concealed by the skirting. 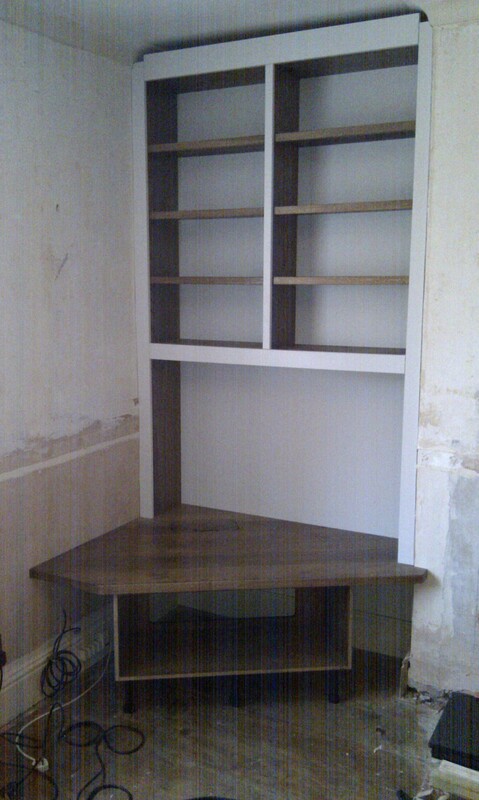 Left alcove fitted and ready for skirting. The shelves are installed on adjustable pins. 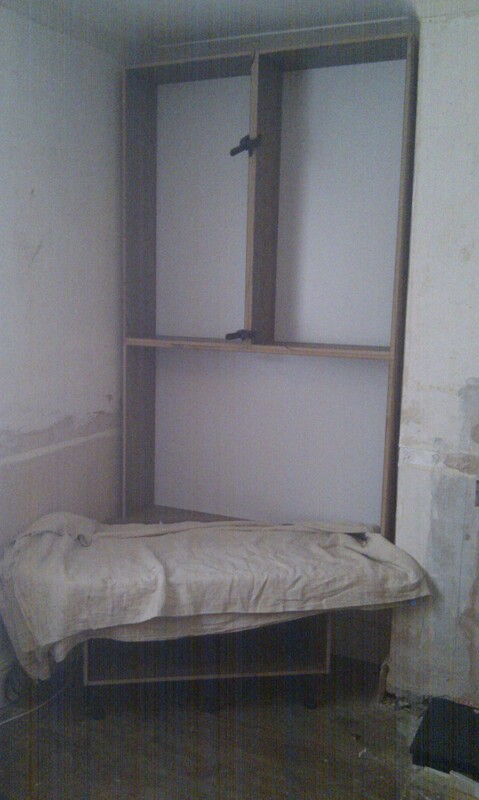 The gap at the top will be concealed by the plasterer with plaster coving to match. 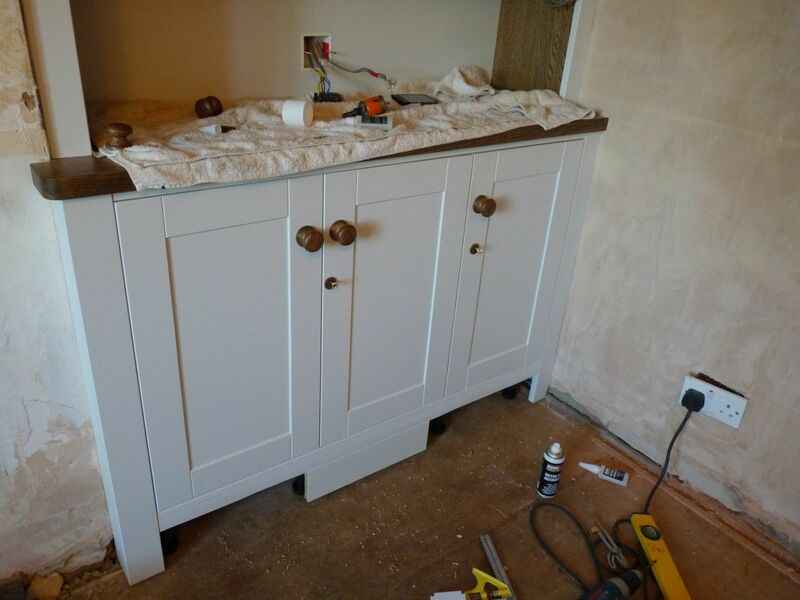 This is the traditional way of finishing the top however there are alternative methods that can be completed using timber. 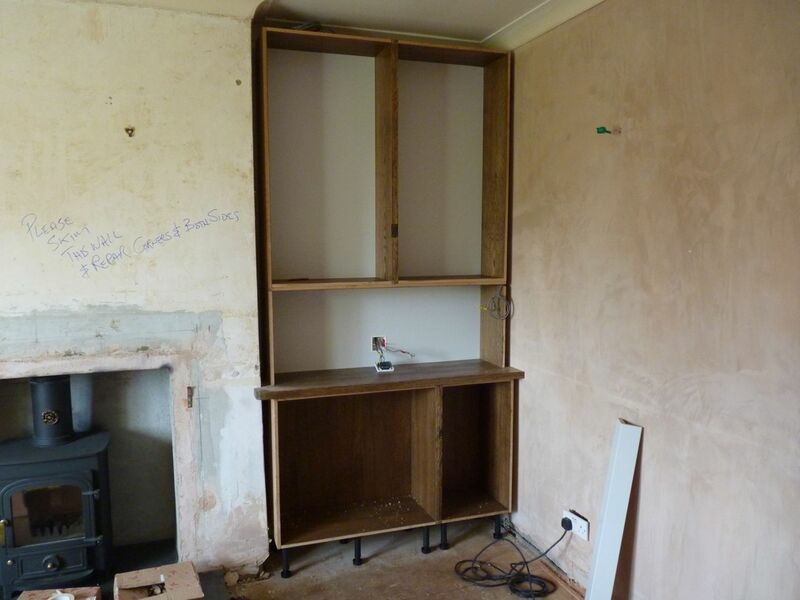 The right alcove with fused spur for the lighting which (as can be seen later on) is moved down by the qualified electrician. 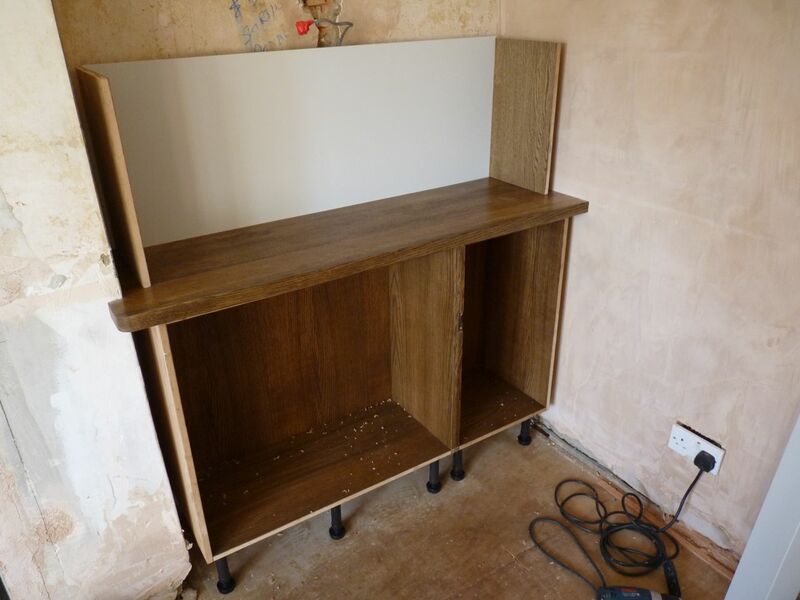 The lower cabinetry is glue and screw assembled before having adjustable feet fitted. 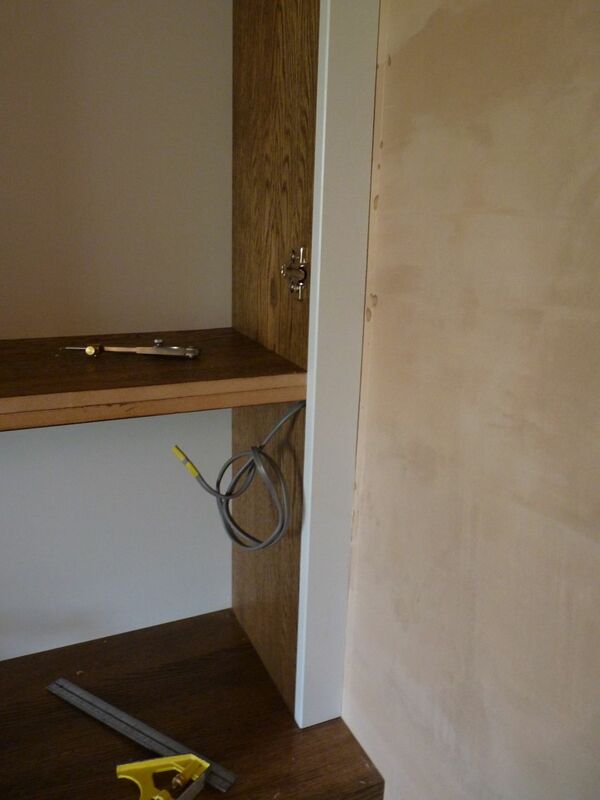 A level line is pencil marked on the wall to position the cabinets to. 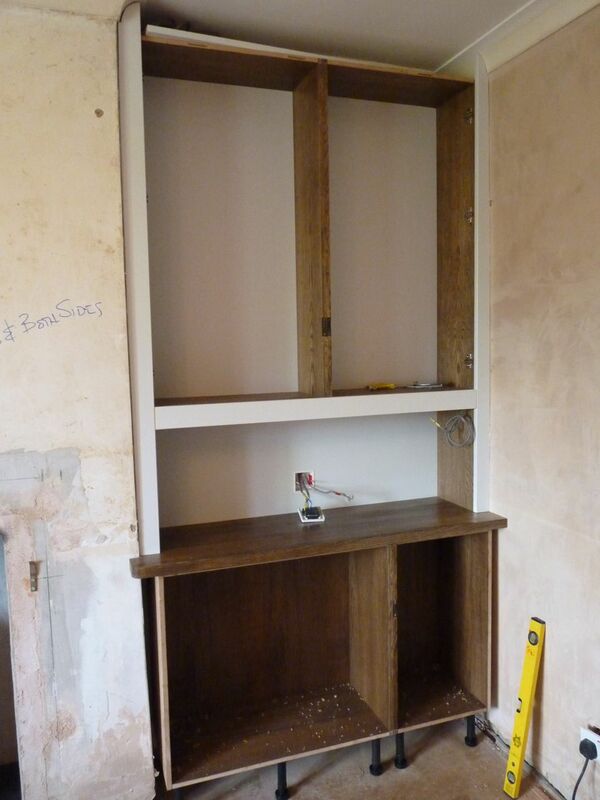 The cabinets are levelled and plumbed before fixing off in position to the back wall. 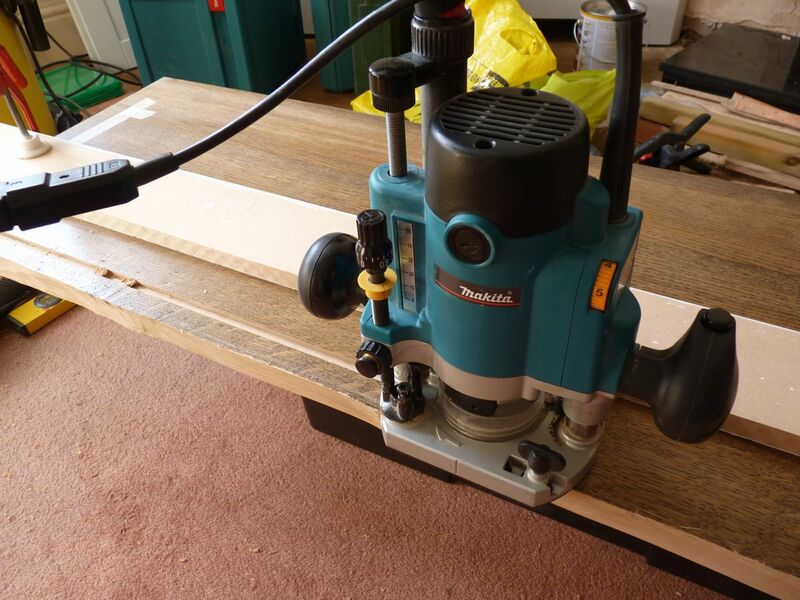 The Oak top is roughly scribed to the wall and back cut to ease fitting before routing the lower back panel groove. Lower back panel and cheeks in position. 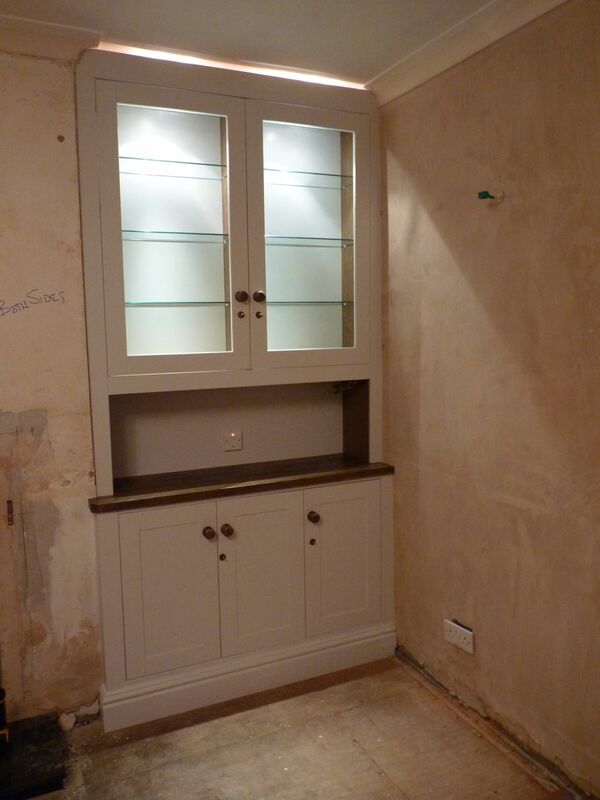 The upper cabinetry goes in and is fixed and anchored as per the left alcove install. Here also can be seen the repositioned fused spur and cable runs at the top and mid right for the down lighting. Scribing the side panels using a compass (on shelf) to transfer the wall line. The scribes are jigsaw cut and fettled to fit with a small block plane. The middle rail is biscuit jointed and glued in position. This will help to stiffen the upper cabinetry and conceal the down light. The lower scribing along with a wall return (left), door, handles, locks and escutcheon fitting. Ready to receive the skirting. The project is completed and handed over to the client and the plasterer to fit the plaster coving (this will hide the light spill at the top). The electrician will be fitting a down light (on order) behind the middle rail. The wall edges are concealed with decorators caulk for a seamless fitted finish. Right alcove. 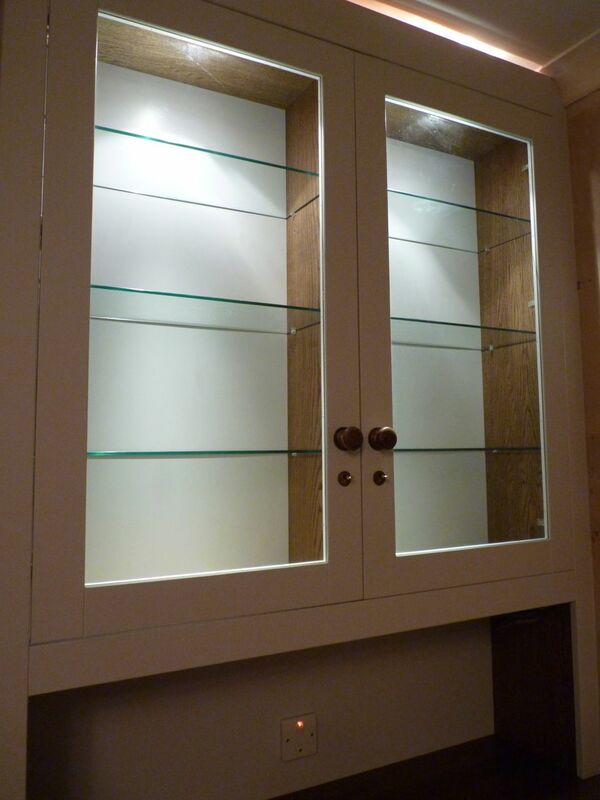 Right alcove detail showing 6mm toughened glass shelving. 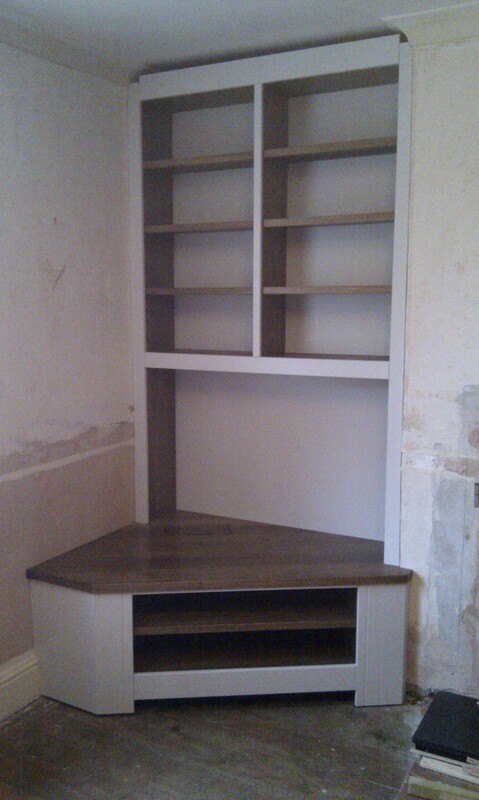 Right alcove showing lower internal cabinetry and shelving. 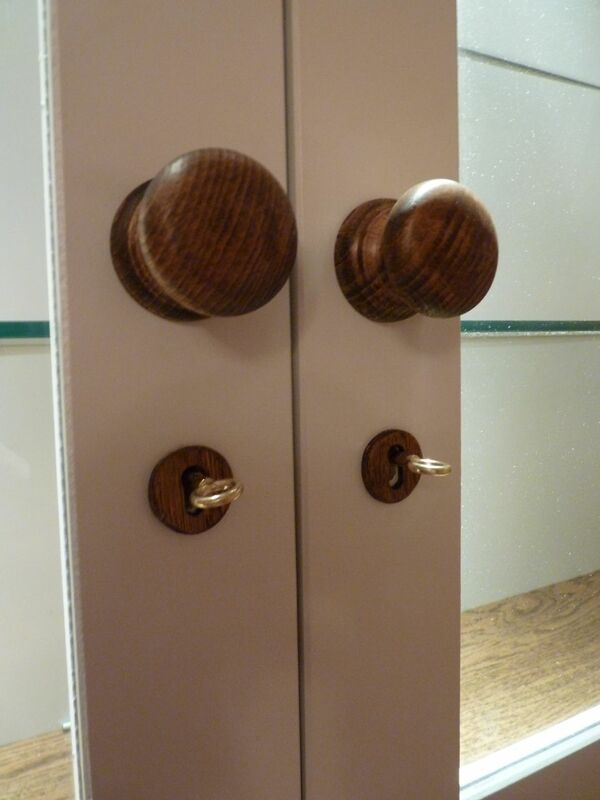 Right alcove detail to show handles and lock escutcheons. 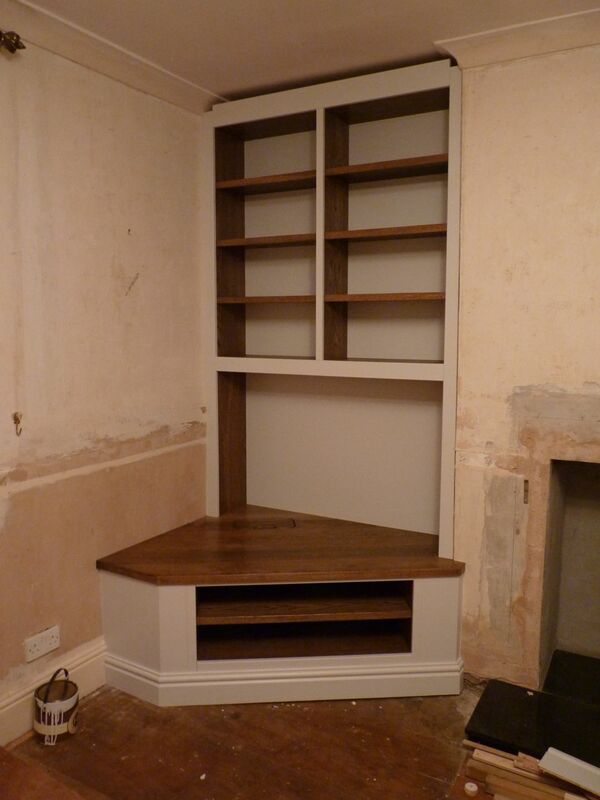 Left alcove with skirting. 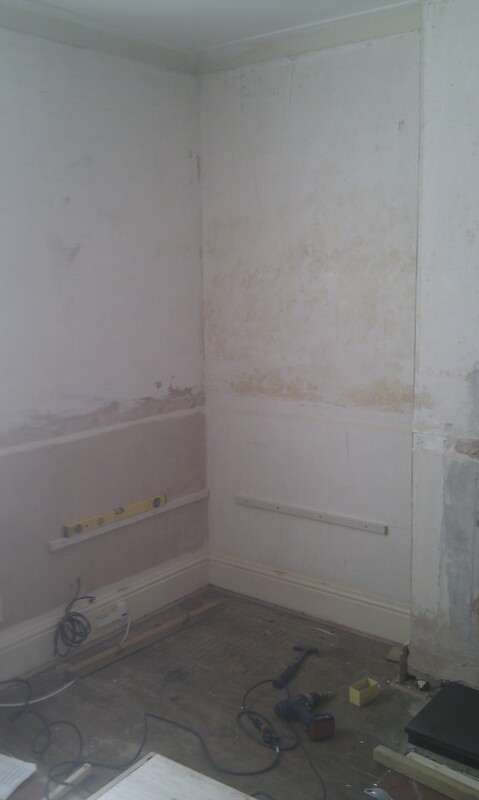 Completed and ready for plaster coving and carpet floor covering. 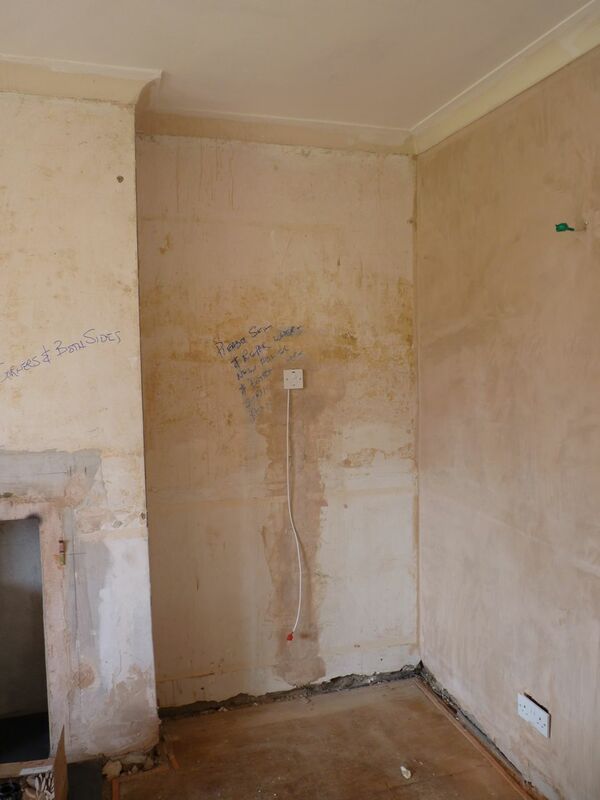 Would you like a picture of the finished room?